What Are the Best Industrial Products for At-Home Messes? No one would argue that paper towels have their uses. However, they also have limitations. Some of the best products for managing life at home can’t be found at the grocery store. For example, the common household solution for protecting floors from spills when you’re working is a tarp. But a tarp doesn’t absorb spills; it simply collects them. The most efficient way to protect your floors from paint and oil is an absorbent mat. The bad news: These aren’t usually marketed outside industrial applications. The good news: You can buy them for your home anyway! What is an Abzorb Mat? Abzorb Mats feature a top layer made of a universal absorbent capable of containing all kinds of liquids. This layer is dark gray to disguise stains and prolong use. The bottom layer is a non-penetrable vinyl backing that’s skid-resistant and will stop absorbed liquids from leaking through the mat to the floor below. The Abzorb Mat is specially designed to lay flat without curling or buckling, which helps prevent trips and falls. Our “stain stopper” backing is so tough that we guarantee it against leaks, cracks, and tears for three years. It’s available in 3-foot and 6-foot widths, and you can even get custom lengths if you need a specific mat size. There are countless uses for this flexible mat in your home or garage! 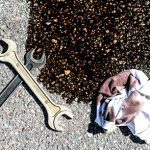 Try placing it underneath where you park or work on your car to catch oil or antifreeze drips and prevent concrete strains. If you live in an area that gets a lot of snow in winter, the Abzorb Mat is perfect for catching melting snow runoff from vehicles, snow removal equipment, and even boots in the entryway or mudroom. 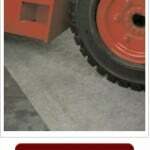 The Abzorb mat’s anti-slip properties make it great for back doors and garage doors. You can use it as a work bench cover, shelf liner, paint mat, craft mat, as well as underneath pet food and water bowls. These mats may be designed for industrial use, but you can find plenty of useful implementations in your own home. Ready to make your life simpler but have questions about which absorbents are right for your needs? Contact Travis Zdrazil at travis@absorbentsonline.com or (800) 869-9633. 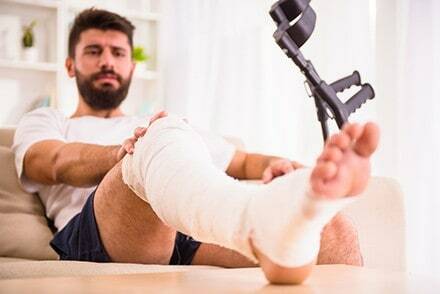 We’re used to our homes being safe places, but your home is actually an incredibly dangerous place: As many as 20 million hospital trips were due to accidents at home in 2002 with slips and falls being the most frequent causes. The good news is you have the power to make your home a safer place. Here are a few easy ways to do just that by preparing for leaks and spills that could present slip or fall hazards in your home. You can give your stairs some extra safety features with Safety Stair Treads. These non-slip treads can hold up for years of service in both indoor and outdoor uses. Nonslip tapes are easy to apply and come in a variety of colors and widths. Fiberglass stair treads are lightweight, easy to install, and excellent for use on wood, concrete, or metal steps. And aluminum stair treads are available in seven colors and are attractive enough for residential use. Choose the variety that’s best for you, and reduce your risk of falls on stairs in your home or recreational vehicle. If you keep fuels or chemicals around the house for automotive or other uses, you can reduce the risk of spills by keeping them in the proper containers. 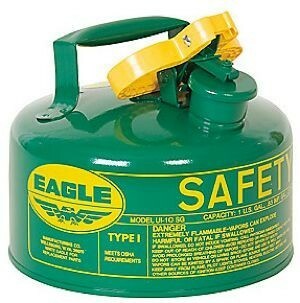 We offer Safety Cans for just this purpose. We have a variety of cans so you can choose those best suited to keep your specific liquids safely contained. Another great way to prevent slip hazards is with Spill Containment Trays for high-spill-risk areas. For example, try positioning these underneath vehicles while doing mechanical work or in the bottoms of shelves or cabinets that hold liquids like paint or fuel. Have an area in your home at high spill risk? 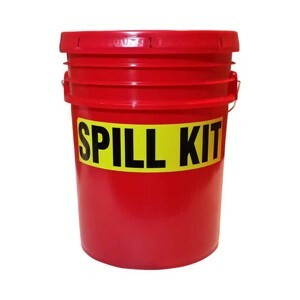 A Spill Kit can help ensure you’re prepared. You might consider keeping a large general-purpose spill kit in your garage and a smaller one on your boat, for instance. 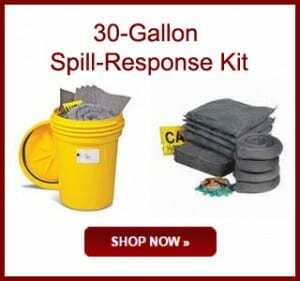 We offer spill kits for all spill sizes and types. Your home may be statistically dangerous, but you can take steps to reduce that risk! Industrial spill absorbent products can help you stay safe at home the same way they help keep workers safe in industrial environments. Want to learn more about absorbents? Need to know which are right for use in your home? The professionals at AbsorbentsOnline can help. Contact Travis Zdrazil at travis@absorbentsonline.com or (800) 869-9633. There may never be as unassuming and promising a place as the American garage. From the Walt Disney Company to Amazon and Google, leaders of some of the biggest and most successful companies in the United States started their empires in humble garages. The garage is where we moonlight as mechanics, woodworkers, and inventors. It’s where people of all ages and walks of life experiment, tinker, and enjoy our hobbies. Do you work on your own cars? What about fixing your lawn equipment? 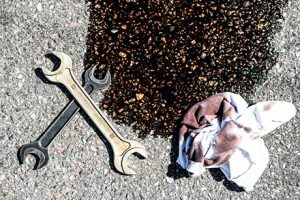 The home mechanic can benefit from Universal Absorbent Pads in the garage to prevent oil leaks from reaching the floor. These pads are strong, highly absorbent, and suited for oil as well as water-based liquids. Don’t let boat fuel refills contribute to water pollution! Oil Absorbent Pads repel water but absorb oils quickly. Add this best-seller to your water sports packing list! For whatever random leaks might happen in your garage, our Absorbent Pillows are ready for speedy cleanup. Choose Universal Absorbent Pillows to tackle a variety of spills, or grab more specific pillows to target your specific spills. Does water leak into your garage on rainy days? Do you experience drafts? Our Absorbent Socks come in four different varieties to keep wind and water out of your workspace. 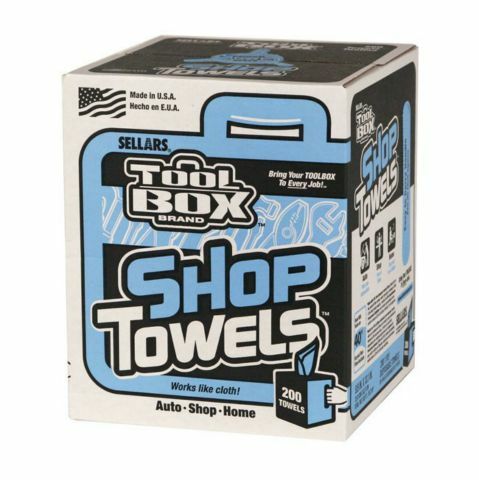 You can also use them to protect cabinets or walls from water damage. If you’re looking for durable, long-lasting floor mats that can absorb all kinds of liquids as well as prevents slips and falls, look no further than the Abzorb Oil Mat. This mat’s “stain-stopper” backing is also slip-resistant, making it a perfect choice to position under the car in the garage or even keep snowy boots or lawn equipment on to prevent them from creating puddles. Whether you place them in the kitchen, hobby room, basement, or garage, our Anti-Fatigue Mats are stress-reducing and ergonomic when you use them in areas where you do a lot of standing. If you want to be ready with only as much or as little absorbent power as you need for any given spill, consider our Granular Absorbents. These loose absorbents are made from all-natural or recycled materials and come in a variety of packaging sizes to suit your needs. We all use cloths and rags around the house to clean up spills and accidents quickly. Why not try products designed for that purpose? Industrial Wipes and Shop Rags are highly absorbent and are even available pre-treated with degreasers. If you own a yacht or motorboat, you should be prepared for spills while out on the water, too. We offer a variety of Marine Spill Absorbents to help you contain hydrocarbon spills on water. If you live in an area where storms are frequent, it may benefit you to stock up on Stormwater Management Products. Drain guards can protect drains from gathering sediment and trash and can even block your drain in case of a spill that you don’t want spreading into your pipes. Industrial products don’t have to be limited to industrial uses: With some preparation and creativity, you can make your garage, boat, or RV safer and cleaner — inside and out! Do you want to make your home spill-ready and safe? To learn more about which industrial products make sense for you, contact Angie Meza at angie@absorbentsonline.com or (800) 869-9633. Sometimes a spill doesn’t just need to be absorbed, it needs to be contained — or even redirected. For example, depending on the severity of rainfall, storm water runoff could be difficult or impossible to redirect or fully contain, which can cause major contamination risks. This case would be the perfect application for berm dikes, essential tools for any facility where employees handle pollutants or waste. Berms come in many forms, but all of these non-absorbent tubes act as barriers to liquids, allowing you to guide or contain them. To choose the right berm, it’s important that you examine the application for the berm and select one that meets all your needs. For example, the size of the berm will depend on the size of the spill or liquid to be contained. We offer berms small enough for tabletop sample or chemical testing stations as well as up to 10 feet long for larger applications. Need more than 10 feet of length? We also offer connectors, so you can combine 10-foot lengths (or any of the other lengths we offer — they’re all so easy to connect!) into whatever length you need. Need to fit a weirdly shaped space? Berms are easy to bend, so they can fit any curve or angle. To ensure that your berms are available quickly and efficiently in cases of spills or weather events, you should store them near areas where they will most likely be needed. Luckily, our new spill dike storage case makes it easy to protect and store any of our berms, including the 10-foot length option. Our sturdy berms are completely reusable and can be cleaned easily with soap and water to prepare them for future use. Since the polyurethane is tacky, the berm will stick to itself if not stored properly — but our spill dike storage case features dividers to keep your berm from doing so. By cleaning and storing berms properly between uses, these important tools are sure to be great investments that will provide years of trouble-free use. Check out our different berms and the new spill dike storage case on our website. How Often Should You Change Your Storm Drain Filters? 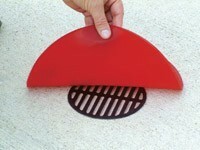 Storm drain filters are the easy solution for keeping waste out of the water system. But these filters only work their best for so long before you need to replace them. There are a few telltale signs that it’s time to replace your storm drain filter. Sediment buildup — If there is one-quarter of an inch or more of sediment buildup, your filter insert most likely needs to be replaced. Debris buildup — Buildup of large debris, such as trash, might just mean that the drain filter needs to be cleaned, but keep an eye out for any other signs that it needs to be replaced. Standing water — Four inches or more of standing water around the drain 24 hours or longer after rain is a sure sign that your storm drain filter requires maintenance or replacing. Hazardous material discharge — If any hazardous material that the filter is intended to absorb (such as motor oil) is being discharged by the filter, it’s time for a replacement. Visible scum — It’s time to replace the filter if there is a visible line of scum building up around it. This is usually a sign of recurring standing water. Three years — Regardless of the state of the filter, if three years have passed without it being replaced, it’s time! We have three different storm drain filter models available, so you will be sure to find one that suits your specific facility needs. Check them out on our website. Want to learn more about storm drain filters? The experts at AbsorbentsOnline can help. Contact Travis Zdrazil at travis@absorbentsonline.com or (800) 869-9633. Unfortunately, when it comes to spreading pollutants, nothing does it more efficiently than our very own water systems. Some materials might seem harmless when applied to a small area (e.g., pesticides sprayed on lawns or motor oil spilled on pavement), but when the rain comes, any runoff water carries with it whatever pollutants it encounters. In industrial areas, this risk is even higher: Manmade surfaces, such as pavement or buildings, don’t absorb water like soil does, which results in increased runoff volume. This means that what we throw on the ground in urban areas is likely to end up in bodies of water. With that in mind, it should come as no surprise that there are regulations in place to try to limit industrial storm water pollution. To ensure that you stay compliant with regulation and avoid water pollution, it’s imperative that you implement certain best management practices in your storm water pollution prevention plan (SWPPP). Educate and train employees. It’s not useful to have a prevention program in place if your employees don’t know how to implement and maintain it. Any employees who work with materials that may be exposed to storm water — as well as those who will be responsible for tasks required by your SWPPP — need to receive regular training. The EPA recommends this training occur at least annually. Make sure to track which employees have received training at what time so you can ensure your staff is always fully equipped to handle any storm water concerns they may face in their day-to-day work. Establish controls for properly disposing of waste and pollutants. To prevent everyday materials from ending up in storm water runoff, you need non-structural controls in place. Non-structural controls focus on facility operations such as posted signage or defined procedures. Remember that controls also need to be regularly evaluated and updated to remain effective and relevant to your facility’s current state. Understand your pollutants. Each facility has different pollutants to deal with, so it’s imperative that you put your SWPPP together with a complete foundational knowledge of the specific pollutants that it must be prepared to address. From vehicle-related pollutants to chemicals and trash, make sure to analyze every part of your facility where pollutants may be exposed to storm water. Address each concern in your plan. You never know when the weather will change or how long a storm could last, so you must make sure you’re prepared to deal with storm water runoff when it happens. Okay, you have spill kits. But having them isn’t enough — what do you do if and when those dreaded spills actually occur? First, you have to make sure you’re prepared for spills before they happen. You can reduce the risk of damage and injury by having spill kits handy. (For information about how to choose them, read 3 Things You Need to Know About Spill Kits.) You also need to have a plan in place. To prepare, make sure you inventory all of the liquids on your site — know what they are, where they are, and their volumes. New Pig recommends going a step further: Identify which areas are at high risk of spills and take note of the worst-case-scenario volume of liquid that you may have to deal with at each location. Then, ensure that your spill kits are well-suited for the types and volumes of liquids and that they are accessible. You can make spill cleanup easier by preparing a Safety Data Sheet, as recommended by the Occupational Safety and Health Administration, for each liquid at each location. Check regularly that these sheets are up to date so employees can refer to them at the time of spills. So how do you use spill kits? An essential part of proper spill preparation is ensuring that your staff is trained on how to use spill kits. Conduct regular training on spill-control best practices, safety tips, and the use of spill kits. Have “spill drills” in which your staff responds to mock spills; drills are great ways to test your preparedness, find weaknesses, and identify areas for improvement. Pads — Absorbent pads should be placed directly on spills to absorb liquids quickly. Socks — Use absorbent socks to circle spills to contain liquids and prevent further spread. Make sure to overlap the ends of socks to create leak-proof barriers. Pillows — Like pads, absorbent pillows should be placed directly on top of spills. Pillows will absorb a higher volume of liquid than pads. Goggles — Goggles should be worn when cleaning up spills to protect the eyes from hazardous liquids, which may splash during cleanup. Gloves — During spill cleanup, nitrile gloves will protect hands from hazardous materials. 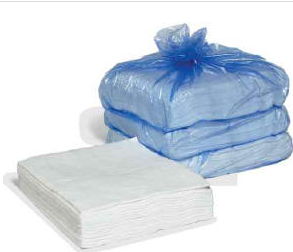 Bags with ties — These disposable bags tie closed for easy disposal of used absorbent materials. Instruction sheet — Each spill kit includes an instruction sheet to answer any additional questions users may have. Empty drums are also available for purchase if you want to build your own 30-gallon spill kits from the absorbent materials we offer. Need more in-depth information about one or more of these items and how they’re used? Contact AbsorbentsOnline, and we’ll be happy to help! Since their invention in the early 20th century, forklifts have become not just useful, but necessary machines in any industrial setting. These powerful and versatile tools have greatly expanded our abilities to lift and move large objects easily — but that power, when not handled properly, can easily become dangerous. Last month, an employee at a Florida building products company was pinned between a forklift and some metal shelving, and died after being transported to the hospital. A few months before, a New Jersey construction company employee backed his forklift over a coworker, who was left in critical condition. Although these may seem like simple mistakes to avoid, when you’re using a forklift every day, it’s easy to grow complacent with repetition. Make sure you’re following these best practices to avoid forklift accidents. Keep your hands clean and dry to prevent slipping when grabbing the handhold. Grasp the handhold (not the steering wheel) with a solid grip when entering the vehicle. Watch your footing carefully when entering or leaving the vehicle. Lower your body carefully when exiting the vehicle (do not jump down). 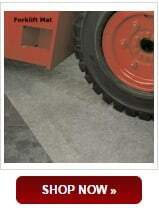 To improve forklift safety in your workplace, try our forklift mat. This mat not only helps to prevent slips and falls by absorbing hydraulic fluids, oil, or battery acid that may leak from forklifts, but it has the added bonus of protecting your floors from these leaks as well. This superabsorbent polypropylene mat has a non-penetrable, non-skid vinyl backing and won’t be damaged by forklifts driving over it — even through many years of use. Prevent slips and falls with this affordable product, which comes in rolls, allowing it to be cut to the desired length. Absorbent Pad or Pillow: Which Do You Use — and When? In any workplace where liquids are used — be they oils, chemicals, water, or other substances —employees have to be prepared to clean up leaks and spills. 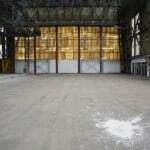 To make your spill cleanups quicker and safer, you can use any of a number of absorbent products, such as those available at AbsorbentsOnline.com. Two of the most commonly used absorbent products are absorbent pads and absorbent pillows. At first glance, pads and pillows don’t seem too different: A pillow is thicker than a pad, and slightly more expensive. But those aren’t the only differences between these products —absorbent pads and pillows actually have very distinct uses. Knowing what those uses are can help you choose the right absorbent product to prepare for spills in your workplace. Absorbent pads come both individually (sold by the case) and in rolls. 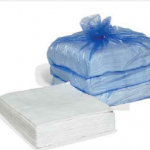 Supplied in large quantities, pads are geared toward all-purpose use — for wiping up or absorbing small leaks, placement in spill kits, and even to reduce slip and fall dangers. Absorbent pillows are for heavy-duty spill containment. They absorb more fluid than an absorbent pad can, and they also fit well into tight spaces, such as a fluid reservoir, waste trough, or hard-to-access area of machinery. Use your knowledge of your workplace’s needs to determine which absorbent products you should have on hand. Many workplaces like to stock both pads and pillows, so that they are prepared for any eventuality. Absorbent Pillows — Available in a variety of sizes, and color coded for easy identification. 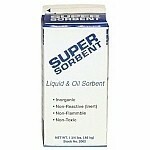 Oil Absorbent Pads and Rolls — Repel water-based fluids and absorb oil-based fluids. Economy Oil Spill Cleanup Pads and Rolls — A cost-effective option for oil spills. Chemical Spill Absorbent Pads and Rolls — Designed to absorb most caustic and aggressive fluids. Universal Absorbent Pads and Rolls — The favorite for industrial applications, these pads and rolls absorb aggressive and non-aggressive fluids. No single absorbent material is ideal for every spill situation. To ensure that you have the materials you need to clean up fluid spills quickly and safely, stock up on the absorbent pads and pillows that best suit your needs. Want to learn more about absorbent pads and pillows? AbsorbentsOnline can help. Contact Travis Zdrazil at travis@absorbentsonline.com or (800) 869-9633. 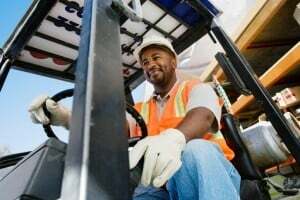 Here’s a sobering fact: Every year, 20,000 U.S. employees are seriously injured and 100 are killed in warehouse accidents involving forklifts. Forklifts are among the leading causes of workplace injuries in warehouses. These accidents usually include overturned forklifts and collisions with pedestrians, pallets, or other equipment. Not to mention that these accidents can cause costly damage to your equipment. That’s why it’s important that forklift operators be trained to operate forklifts safely. But beyond ensuring safe operation, what can you do to reduce the chances of forklifts causing accidents and damage in your workplace? Luckily, there’s a simple solution: safety barrier products. These durable, fixed objects prevent entry of forklifts and other vehicles, allowing you to protect dangerous or vulnerable areas and make safe areas for pedestrians. And as a bonus, they’re incredibly easy to install. Guard rails — These rail assemblies are used to protect large areas against vehicle collisions, provide pedestrian walkways, and protect buildings from damage. Machine safety guards and rack guards — These high-visibility yellow steel safety rails are easily installed with steel plates. They are maintenance free and will provide years of protection for your equipment and employees. Steel bollard posts — These sturdy steel posts are an easy way to prevent property damage. They can be filled with cement, if desired. Column protectors — Make sure your columns and beams are both visible and protected with impact-absorbing, high-density polyethylene column protectors. Wall protectors — These energy-absorbing wall protectors can be installed at any height to prevent damage to your concrete, drywall, or block walls. Forklift mats — This super-absorbent polypropylene mat protects your floors from spills and equipment, and your employees from slips and falls. It is sold in rolls, so you can cut the mats to suit your space. Safety barriers are a low-tech, economical workplace safety product. They’re so easy to implement, there’s no excuse for any business that uses powered industrial trucks to be without them.